The concept of designing perpetual pavements has obvious economic advantages when lifecycle costs are evaluated. 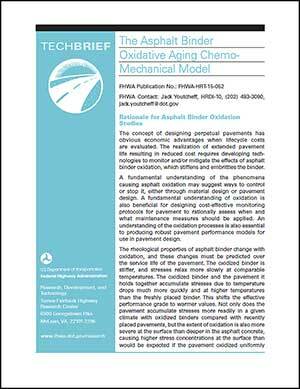 The realization of extended pavement life resulting in reduced cost requires developing technologies to monitor and/or mitigate the effects of asphalt binder oxidation, which stiffens and embrittles the binder. A fundamental understanding of the phenomena causing asphalt oxidation may suggest way to control or stop it, either through material design or pavement design. A fundamental understanding of oxidation is also beneficial for designing cost-effective monitoring protocols for pavement to rationally assess when and what maintenance measures should be applied. An understanding of the oxidation processes is also essential to producing robust pavement performance models for use in pavement design. The rheological properties of asphalt binder change with oxidation, and these changes must be predicted over the service life of the pavement. The oxidized binder is stiffer, and stresses relax more slowly at comparable temperatures. The oxidized binder and the pavement it holds together accumulate stresses due to temperature drops much more quickly and at higher temperatures than the freshly placed binder. This shifts the effective performance grade to warmer values. Not only does the pavement accumulate stresses more readily in a given climate with oxidized binders compared with recently placed pavements, but the extent of oxidation is also more severe at the surface than deeper in the asphalt concrete, causing higher stress concentrations at the surface than would be expected if the pavement oxidized uniformly with depth. Oxidation also changes the pavement failure strength. Without being able to understand these changes in nearly quantitative terms, pavement performance models cannot accurately predict the behavior of aged pavements.